We look forward to celebrating our milestones and evolution over the past two decades, as we recognize our outstanding team of volunteers and community partners. Click here to learn about how you can support our volunteers by helping us provide essential Crisis Response Kits. On October 25, 2018, Senator Gwen Boniface made a statement to the Senate Chamber congratulating North Simcoe Victim Services on its 20th Anniversary and two decades of service to the community. Listen here and read the full statement here. Thank you for your support, Senator Boniface! Thank you to everyone who joined us for this special Annual General Meeting to launch our 20th Anniversary. Read the news release here and download the 2017-2018 Annual Report here. 1987 Ontario Ministry of the Solicitor General conducts three pilot projects in Ontario to test a new method for assisting police officers to meet their concerns about victims of crime – Victim Crisis Assistance and Referral Services (VCARS) was operated in Algoma District, Brant County and Frontenac County. 2001 Over 250 calls completed and over 600 clients served. March 2005 Retired NSVS volunteer, Carol Ivey, established the Victim Crisis Service Endowment Fund to be administered by The Community Foundation of Orillia and Area. 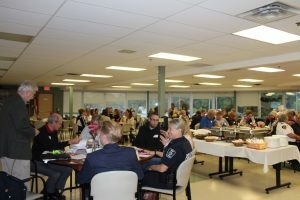 2014 Orillia Community Action Network (O-CAN) is formed to address public safety and community well-being issues; Orillia Situation Table formed to mobilize services; and Partner Agency Working Group formed. 2015 New logo, vision and mission statement is created, along with new website and strategic priorities. 2015 Communications plan developed to support strategic priorities; communications specialist hired to assist. 2017, 2018 Recognition events held with funding from Department of Justice to commemorate Victims and Survivors of Crime Week. Learn about the impact of the work of North Simcoe Victim Services over the years from our clients, volunteers, first responders and community partners. 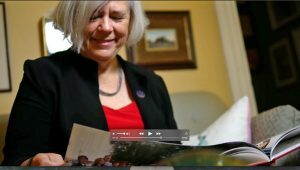 Pat Hehn, our inaugural Executive Director, discusses the launch of the organization and the first volunteer graduating class: View the video here. Sometimes NSVS support to clients does not occur as a one-on-one situation, but within a crisis that affects a number of people at once. This was the case when NSVS received a call to assist at a long-term care facility that was flooded due to a malfunction in the sprinkler system. It was a cold winter night and all of the elderly residents needed to be evacuated. A school bus was provided to transport the residents to a warm, dry location, however, the NSVS team leader quickly realized that additional volunteers would be required for the many people needing assistance. Back-up staff were notified and began to call other NSVS volunteers. Within 30 minutes eight volunteers were on the scene and briefed. They worked in pairs to assist residents out of their rooms and onto the bus. Once everyone was safely on the bus, the volunteers followed along to the temporary facility. Red Cross personnel were able to provide residents with emergency cots, while NSVS volunteers assisted with registering the temporary residents and completing needs assessments for each person. 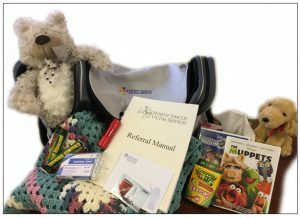 Without the assistance of the NSVS volunteers, who were called without advance notice, the experience of the residents may have been more traumatic. With food, warm blankets and the emotional support provided, the situation was made much more tolerable for the elderly residents and less stressful for staff involved. NSVS was contacted by a man who was the victim of a break and enter. He and his 7-year-old son, who has autism, were house sitting for a family member. The house was broken into and the thieves took the man’s wallet, containing his cash and all of his identification, and stole his son’s tablet, Xbox and games, allowance money and cell phone. NSVS was not able to replace his money, but were able to assist with food. The father was asked to make a grocery list with foods his son liked to eat. Volunteers purchased the items and delivered the groceries, along with some new small toy cars for the boy. They also provided the contact information for replacing the stolen ID. A short time later the man phoned the NSVS office to let us know that his son was so thrilled with the cars we sent for him and that he really wanted to say thank you. He asked if it was okay to put his son on the phone. The young boy thanked us and said how much fun he was having playing with his new cars. The father came back on the phone and told us that the look on his son’s face when he saw the cars was priceless. He was choking back tears as he thanked us profusely for the help we had given them. He said that we had made a horrible situation much brighter. Volunteers were called to respond to a domestic violence situation. When they arrived, they were told that the female victim refused to give a statement to the police. The volunteers introduced themselves and the woman allowed them to enter her home. She was silent and withdrawn. The volunteers spent some time with her talking quietly. They made sure she did not require medical attention and told her about options should she decide to leave the abusive situation. All throughout the woman sat very quietly with little response. The volunteers left and reported that they felt they had not been of much help. This story truly speaks to the difference NSVS volunteers can make in a person’s life. A young woman walked into our office and asked for help. I met with her and listened as she told her story – a new romance, a new relationship that moved very quickly into sharing a place to live. All seemed perfect. She had two sons under ten years old; he had one son, age 14. After almost a year, her oldest son, age 8, disclosed that the 14-year-old had sexually molested him. Children’s Aid Services, OPP and a sexual assault clinic then became involved in the case. The family broke up; the 14-year-old was charged, and the mother came to us – distraught and confused. She didn’t know how to best help her son, what to say or not say, or what she was going to do. She thought counselling might help. NSVS helped apply for funding, which was approved for counselling for her and her sons. She was referred to the housing resource centre for help finding a place to live, and we discussed the elements of a good relationships and different ways to engage with her son. My name is Melina and I was a victim of a sexual assault. Just after my attack I was offered many different avenues of help. I came into contact with North Simcoe Victim Services (NSVS), who helped me to write a victim impact statement for court… They not only helped me through a very difficult time, they showed me compassion. They have supported me through every “Brydon’s Way Walk event and treated me with respect. I decided to donate all the proceeds of Brydon’s Way to (NSVS) because I had heard that their funding had been reduced. I was disappointed to learn this because what they do is so important to our community and everyone they come into contact with… They have made such a positive impact in my life and for that I am forever grateful. We are often called to assist our neighbours and our community when disaster strikes. Along the way, we realized that, for the victims of these tragedies, the struggle is only just beginning as we pack up and leave. Victims of fires are left with immediate and long term needs, both mental and physical, that have to be addressed. We noted your agency, along with two others, play key roles in this care and we wanted to help in whatever small way we could.